Card Text After a creature is destroyed fighting Brain Eater, draw a card. 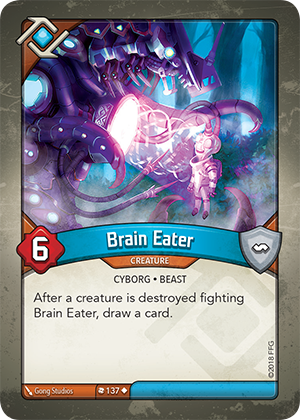 Is the controller of Brain Eater able to draw a card if Brain Eater is destroyed during a fight? No. Brain Eater must survive the fight in order draw a card. Is the owner of Brain Eater able to draw a card if Brain Eater destroys a creature while being attacked? Yes. This effect is not a “Fight:” ability, and is instead a constant ability that works on either player’s turn.